Since gaining her B.Mus. (Hons) Degree and PGCE Teaching Qualification, Elaine has worked as a Peripatetic Music Teacher in Primary and Secondary Schools throughout Carmarthenshire. Elaine has been part of our choir’s music team since 2001 and in recognition of her skill and dedication, was appointed Conductor in 2007 and Musical Director in 2008. Siân is a graduate of the Royal Welsh College of Music and Drama, specialising in piano accompaniment. Over the years Siân has appeared as guest accompanist for singers such as Rebecca Evans, Gail Pearson, Donald Maxwell and has accompanied at Master classes given by Stephen Isserlis and Julian Lloyd Webber. Carlijn is a composer of contemporary classical music based in Cardiff, Wales. Her work includes opera, music theatre and ballet as well as music for choirs and chamber ensembles. In 2016, her opera Martine&Martinus for soloists, choir and chamber orchestra was performed in the Dom cathedral of Utrecht, the Netherlands by the Domcantorij and dance/theatre group DOX. Recent compositions include In Limbo written for the Make An Aria Workshop with Music Theatre Wales and Leap, an orchestral miniature performed by the BBC National Orchestra of Wales as part of their Composition:Wales 2017 programme. 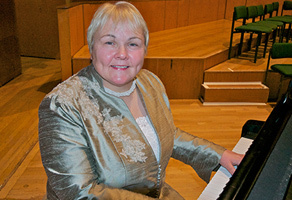 Karen gained her Batchelor of Music at Cardiff University whilst taking time out of a nursing career. Karen has been accompanying choirs and soloists since leaving school and pursued an ambition of obtaining her music degree. She now enjoys dividing her time between accompanying choirs and working as a bank nurse at Ty Hafan’s childrens hospice. 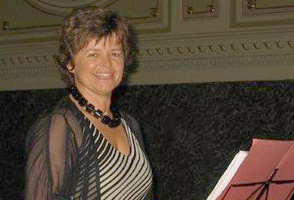 Sheenagh career comprises 40 years of class and peripatetic music teaching, singing and choral conducting. She has taught at Wakefield Girl’s High School, Our Lady’s, Abingdon and is presently a visiting music teacher St Hugh’s Prep School, Carswell. She has conducted Ladies Choirs (Roundelay 1984-99), Men’s Choirs (CMDC 2004 – present day), Mixed choirs (Cantemus Newbury 2000 – present day) and Student choirs too numerous to mention. As a singer Sheenagh is also interested in foreign languages and is currently studying German and Spanish with the Open University. She is also a hands on Grandma, and represents her church as a Street Pastor.